Hi friends, I’m Kendra C. Highley, writer of sweet YA and New Adult romances. I’m what you’d call a…hopeful romantic. I think that’s why I love the holidays so much. There’s so much joy and anticipation in the air. People laugh more and are kinder to strangers. It’s a beautiful time. “The Holly and the Ivy” by Stan Kenton. It’s a big band, old version of the song, and it makes me smile. Cookies. Particularly Snickerdoodles. They taste like Christmas. I won’t turn the Christmas lights or break out the decorations until at least Thanksgiving night. I want to enjoy my turkey and dressing first! I prefer to do my shopping online, so I watch for sales during the holidays. The idea of a crowded mall gives me hives. A medical bag—she wants to go into medical school, but she’s worried about being admitted. This would show Charlotte how much Luke believes in her. A year’s worth of lift tickets at Snowmass in Aspen. Luke’s a world-class snowboarder, and Charlotte would be giving him the means to do what he loves every day. The café where Charlotte works…because they’ve caught a bunch of secret kisses there before. Oh, sweet Jesus, I’ve missed kissing. And Luke was damn good at it. He teased her lower lip with his tongue before nipping lightly at it with his teeth. Charlotte had no idea how her knees were still holding her up. She kissed him back, probably too eagerly, but it was so good she couldn’t help herself. 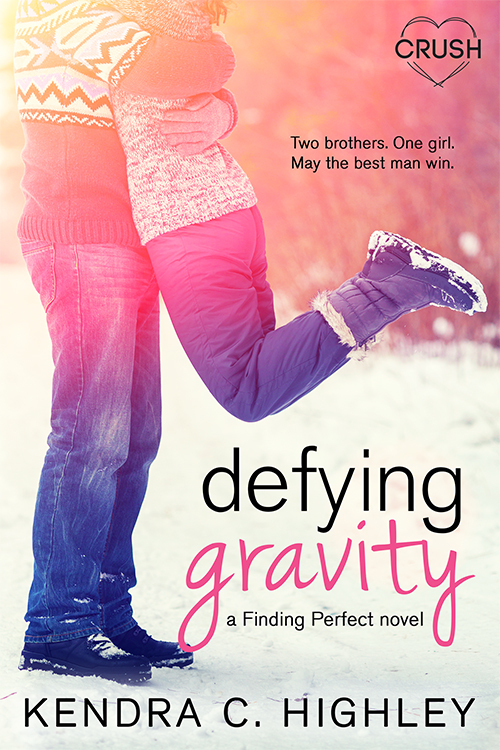 In the meantime don’t miss picking up Defying Gravity for just 99¢!